Bang the gong, break out the champagne, and set off some extra fireworks, because China finally has a bona fide, home-grown blockbuster hit. Painted Skin: The Resurrection (画皮2, or Painted Skin 2), the $18 million sequel to the 2008 smash Painted Skin, last weekend became the first non-Hollywood film in nearly 6 months to beat out the foreign competition and place first at the Chinese box office, with a record-breaking gross of $47 million in its first 4 days. 1. Astute packaging. The film features an array of top Chinese stars—Zhou Xun (The Great Magician, Flying Swords of Dragon Gate), Zhao Wei (Eternal Moment, Love), Chen Kun (Let the Bullets Fly, Flying Swords…), and Feng Shaofeng (White Vengeance)—who together deliver large, complementary fanbases across a wide range of ages and demographics. And director Wuershan, who last directed the martial arts comedy The Butcher, The Chef and the Swordsman, also brings a following as an emerging director to watch. 2. Adroit audience targeting. Painted 2 was developed to target female Chinese moviegoers, who are largely underserved and who had proven their attractiveness as an audience for films like Love is Not Blind (US $55mm gross) and Eternal Moment ($31mm). With its themes of romance and beauty, and with its story centered on two female friends, Painted 2 admirably filled a lucrative niche in the marketplace. 3. “Producer-centric” model. Painted 2 producers Pang Hong and Huayi Brothers chose to avoid the usual Chinese director-centric filmmaking approach, which places ultimate control and decision-making authority in the director’s hands, in favor of a more Hollywood-style approach. They executed a market-oriented strategy in their selection of director, their screenplay development, their choice of release date, and their investment and production management. The film’s success makes it a shining example of the advantages of the “producer-centered” model and its applicability in China, and it could have a long-lasting impact on Chinese film production. 5. Sophisticated marketing. The marketing campaign for Painted 2 began when the cameras started rolling, with the release of a popular phone and ipad app that allowed fans to apply to their favorite photos the golden half mask worn by Zhao Wei’s character, Princess Jing. Additional tactics included wide distribution of teaser trailers in November 2011 and in March and May of 2012, high profile, buzz generating screenings at Cannes and the Shanghai Film Festival, outdoor advertising on the world’s largest LED screen (a 63 meter high screen on the side of a Shanghai skyscraper that was seen by as many as 1.5 million people every day), a 3D only wide release strategy on over 3,000 screens, and heavy social media promotion through Sina Weibo and other online platforms. The marketing team even took advantage of publicity regarding the reported on-set tensions between the two female leads, and of public speculation about who might be the mother of the leading actor’s illegitimate son. Finally, Painted 2 benefited from fortuitous release timing, opening at the beginning of a three-week window that will have no competing Hollywood releases, until the belated Twilight: Breaking Dawn – Part I opens in late July. After months of nail-biting over their shockingly shrinking share of the domestic market, Chinese filmmakers can breathe a little easier this week in the knowledge that all is not lost. The lessons of Painted Skin: The Resurrection are that, by using innovative approaches to producing and marketing their movies, and by selectively adapting Hollywood tactics to the realities of the Chinese market, producers in the PRC can regain their share of the Chinese box office. 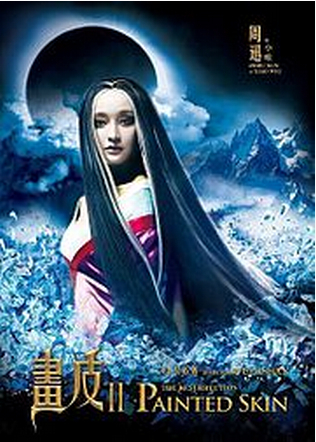 This entry was posted in Analysis, Box Office Reports, General News and tagged Chen Kun, China box office, China Film Biz, Feng Shaofeng, Painted Skin, Painted Skin: The Resurrection, Rob Cain, Robert Cain, Wuershan, Zhao Wei, Zhou Xun by chinafilmbiz. Bookmark the permalink. Thanks, Mike, I appreciate your feedback. Excellent reporting, as always. And Painted Skin #1 is one of my all-time favorites. Looking forward to #2.